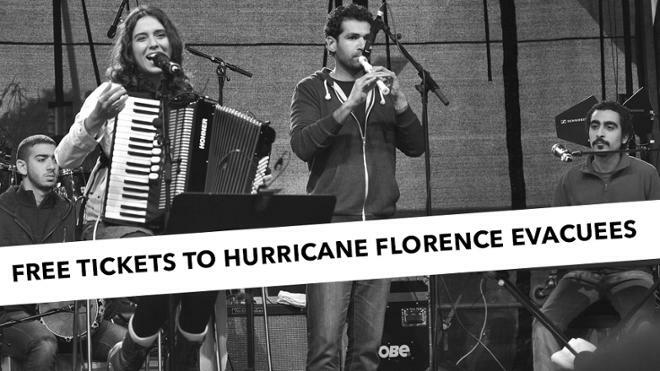 The Modlin Center is offering free tickets to Hurricane Florence evacuees for tonight’s performance. Tickets will be available at the Modlin Center box office beginning at 6pm. Innovative, socially aware, personal, and original describe Egyptian singer, songwriter, composer, and accordionist Youssra El Hawary. Following the release of her first music video “El Soor” (“The Wall”), a sly commentary about the political situation in Egypt, El Hawary has become an outspoken voice for change who chronicles the stories of everyday life. In performance, her charm is matched by her nimble compositions and soulful sound. The presentation of Youssra El Hawary is part of Center Stage, a public diplomacy initiative of the U.S. Department of State's Bureau of Educational and Cultural Affairs, administered by the New England Foundation for the Arts in cooperation with the U.S. Regional Arts Organizations, with support from the Doris Duke Foundation for Islamic Art, and the Trust for Mutual Understanding. General management is provided by Lisa Booth Management, Inc. This performance is also sponsored in part by The E. Rhodes and Leona B. Carpenter Foundation and the The Cultural Affairs Committee.